If you are planning a trip to the city (Kuala Lumpur) this Sunday be forewarned that about 24 roads including two highways here will face partial or full closure this Sunday. This is due to the Standard Chartered KL Marathon. The Start and Finish points will be at Dataran Merdeka - shown on the left in picture below. 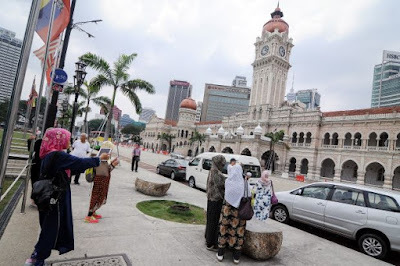 By the way, the building you see on the right is one of KL's landmarks, the Sultan Abdul Samad Building. There are about 35,000 participants and over 2,000 foreign runners from 70 countries participating this year. Best to plan your travels accordingly on Sunday and use public transport whenever possible. The roads that are expected to be closed are the Ampang-Kuala Lumpur Elevated Highway (Akleh), Duke Highway, Jalan Raja (Dataran Merdeka), Jalan Tuanku Abdul Rahman, Jalan Sultan Ismail, Jalan Ampang, Jalan P. Ramlee, Jalan Raja Chulan, Jalan Bukit Bintang, Jalan Tun Abdul Razak, Jalan Kuching, Jalan Tuanku Abdul Halim (Jalan Duta), Jalan Langgak Tunku, Jalan Bukit Tunku, Jalan Tunku, Jalan Tun Ismail, Jalan Dato Onn, Jalan Sultan Sallehudin, Jalan Parlimen, Jalan Damansara, Lebuhraya Sultan Iskandar, Jalan Kinabalu, Jalan Sultan HIshamudin (KTM) and Jalan Tanglin.